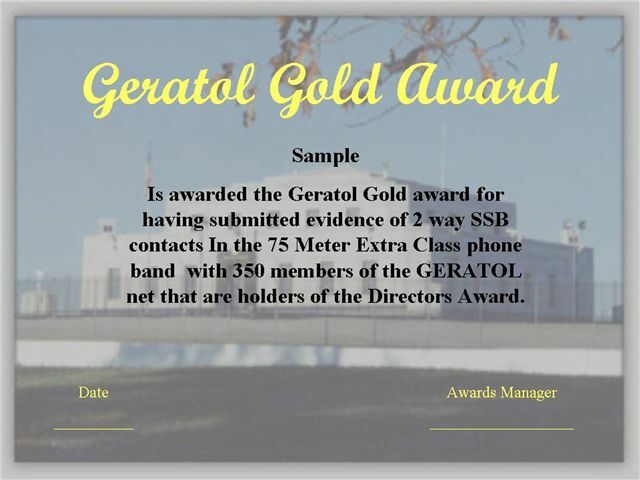 Requires that you work Geratol members that have a Geratol number and that have a Directors Award certificate. You are NOT required to have a Geratol number to work for this award. You must use SSB mode of transmission. All contacts must be made after 0100z 1 October 2002. All contacts must be made in the American 75 Meter band between 3.750 and 3.775 Mhz. After 0501Z December 15, 2006 contacts must be made in the American 75 Meter Extra band between 3.600 and 3.700 Mhz. Work 350 Directors Award serial numbers for the Gold Board Award certificate. Apply for this award or it’s endorsements to the Awards Manager.